Some of you may be familiar with the telegram app which can be used on smartphones and computers. Telegram provides the use of a channel feature to relay information to potentially large groups of people. 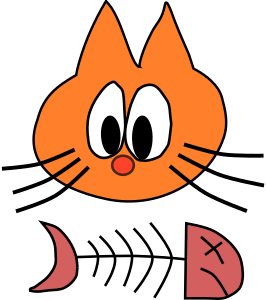 Subscribers to the channel cannot post to the channel but only read the messages posted. We are trialing the use of the channel feature to see if it is beneficial to update people with new posts and any brief points which may not always make it to this site. We were honoured to host Shaykh Khalid Turkestani from Mecca in the last few days of Ramadan. 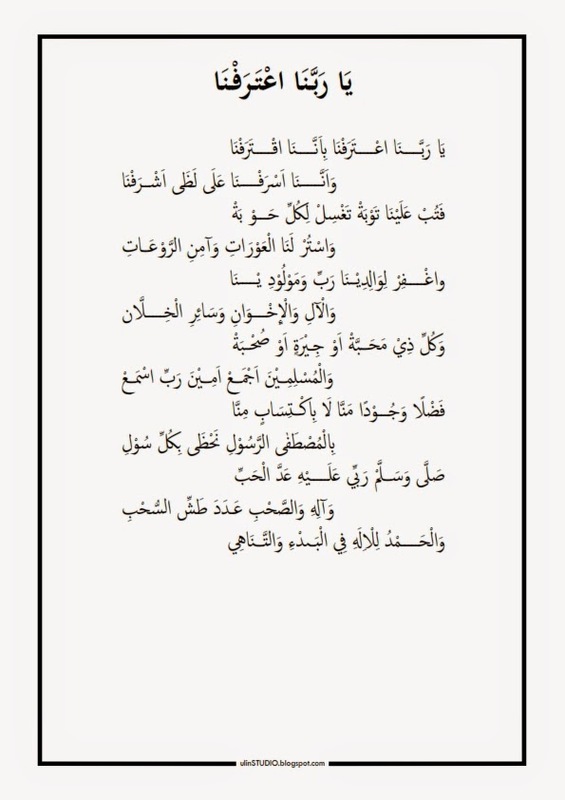 An event he attended was a reading of the Jaliyat al-Kadr poem which he narrates from his teachers back to the author. Alhumdulillah Manaqib productions have beautifully put together the translation of the text undertaken by Shaykh Abd al-Aziz Fredericks. 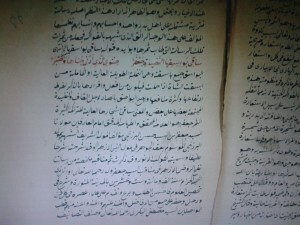 Before Shaykh Turkestani’s arrival he undertook some research on the authorship of the poem and was unable to locate a manuscript of the commentary on the text in the Bayt al-Mawlid al-Sharif due to refurbishments. 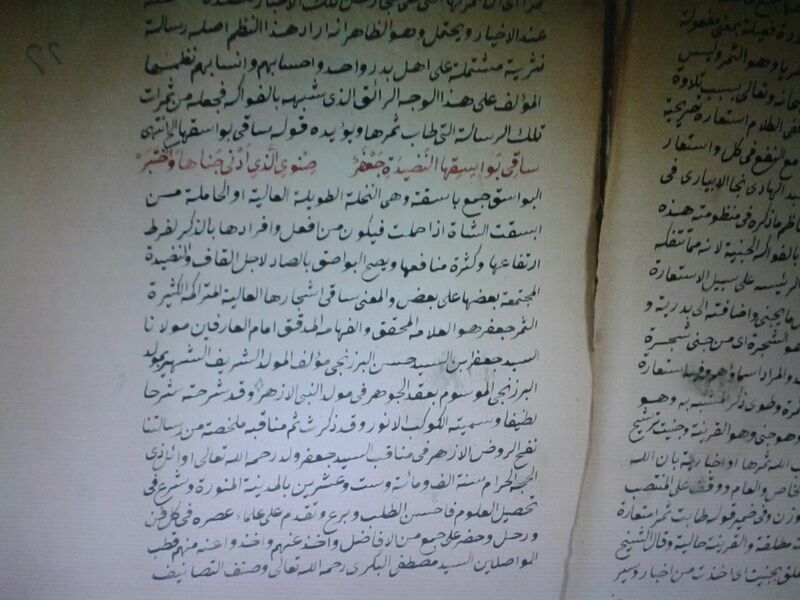 Shaykh Turkestani was finally able to locate the manuscript and sent me the following scans which indicate that the author of the poem is Imam Jafar bin Hasan al-Barzanji, the brother of the author of the original text. 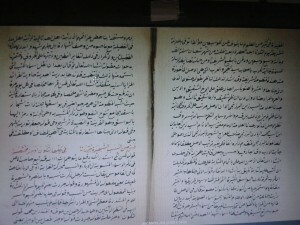 The author of the commentary from which the scan is taken is Imam Jafar bin Ismail al-Barzanji. Shaykh Turkestani requested that this information be conveyed to those interested, may God reward him for his efforts to locate this information. Mention the name of Shaykh Abdullah bin Saeed al-Lahji to someone who is well versed with scholarly works from the Middle East and you will most likely receive a response with the word Shamail included in it somewhere. 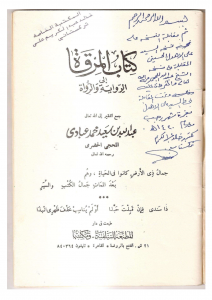 The impact of Shaykh al-Lahji’s scholarly contribution is such that he has become well known for his masterpiece and lifelong work on the Shamail entitled Muntaha al-Sul. 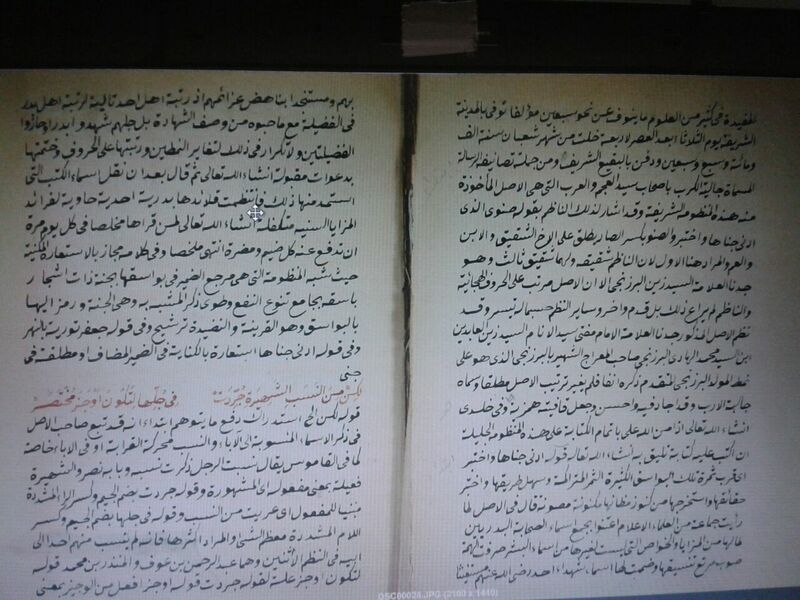 It was because of this work that I came to know of the Shaykh – as mentioned in previous articles on this site – and resulted in seeking out his students when visiting the Hijaz and the UAE. What follows are some glimpses in to the life of Shaykh al-Lahji that were recently shared with me by one of his students who studied with him both in the Haram al-Makki and the Madrasa al-Sawlatiyyah. The points below are not a flowing account, however it is hoped some benefit can be derived from the information presented. His student told me that he first met Shaykh al-Lahji in the Haram al-Makki as a small child when he was of primary school age. He was assigned tasks related to handwriting and carried on these primary studies for a short time. He then left these studies in the Haram al-Makki and attended a regular school and was to only study with the Shaykh again when he was enrolled in the Sawlatiyyah. From then on the studies in the Sawlatiyyah were to be the means for keeping the close company of the Shaykh and benefiting from him. Those familiar with Shaykh al-Lahji’s life will know he was already an established scholar before his migrating from Yemen to the Hijaz, on arriving in Makkah he took up residence in a home on Jabal Umar with his family and children. His home on Jabal Umar was to be his abode until he passed away and was buried in the Ma’ala graveyard in Makkah. His daily practice in addition to his teaching in the Sawlatiyyah school was to come to the Masjid al-Haram before Maghrib time and stay till Isha in the Masjid. This was his well known routine which would only be altered if he would leave the Masjid to pay condolences to the family of someone who was recently deceased. His devotion to his students was absolute both physically and spiritually, early in his teaching career he was very strict with his students and would discipline them, but as his teaching career progressed this changed and his tarbiyah came by way of his spiritual state (hal). As in the words of his student who emphasized this point to me saying, “I personally witnessed this”. Likewise his firasah (insight) was keenly developed such that his students would not have to say anything to him regarding that which was on their minds, but rather he would broach the subject which was troubling them and offer them advice. This firasah was witnessed in his lessons such that Shaykh al-Lahji would at times veer away from the subject of the lesson and directly answer a matter on the students mind totally unrelated to the topic at hand. 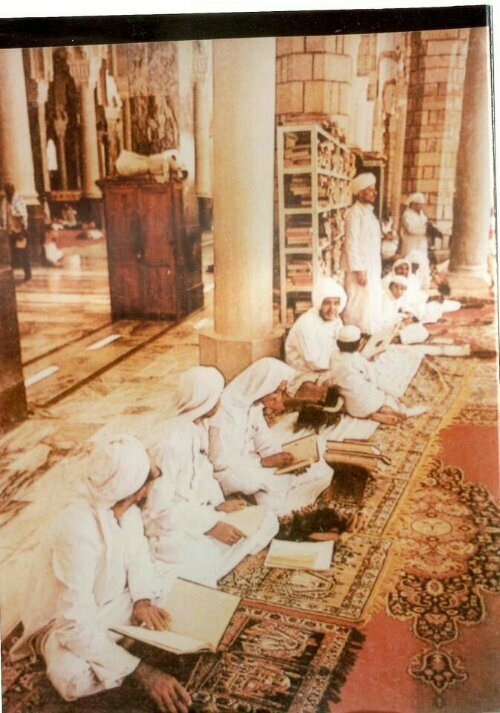 The two days holiday in the week from studies in Makkah were not a real holiday as such, Shaykh al-Lahji would gather together with his students as in the picture above and everyone would be busied with their respective task. Whether it was the memorization of texts, recitation of Quran or worship, everyone was expected to be engaged in something of benefit. On seeing the picture above the student I met mentioned this picture was taken on one of their days off in the week which was always used as an opportunity to review and reinforce what they had learnt. Indeed there was healthy competition between the students in terms of what they had memorized and how far they had progressed. Shaykh al-Lahji loved books, and his students had formed the habit of presenting their recently purchased books to him for approval, more specifically the books that they read with him which he would take and write with his own hand the name of the student who was studying the work with him inside the front cover. 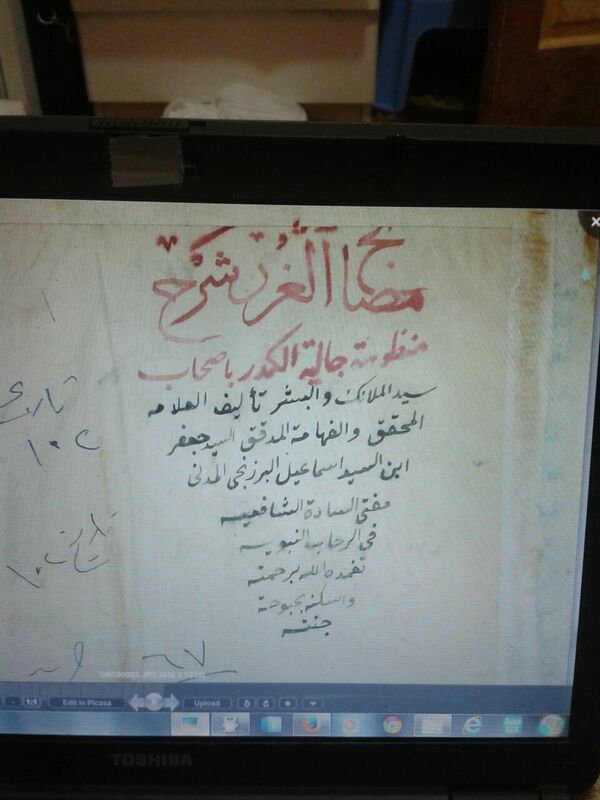 I personally saw this handwriting in a couple of the books that his student had at hand to show me, namely the Shamail of Imam al-Tirmidhi and the Yaqut al-Nafis of Shaykh al-Shatiri in fiqh. 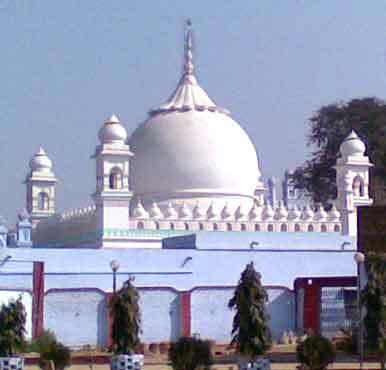 In terms of tasawwuf the Shaykh did not talk openly of any tariqah affiliations throughout the long contact his students had with him, the only possible link his student knowing of being his association in Yemen with the tariqah of the Ahdal family of scholars who have one wird which is called the Thaqbah al-Ahdliyyah. 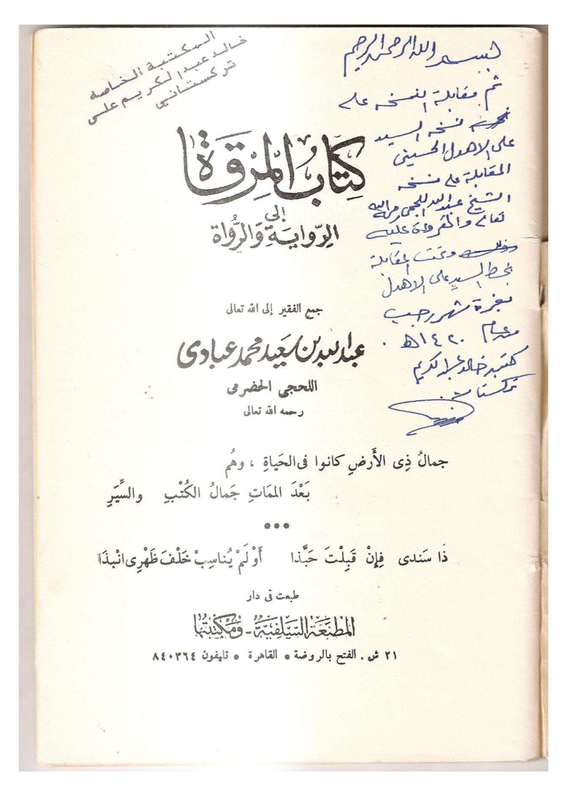 Shaykh al-Lahji personally dictated some adhkar to his students to recite in the morning and evening as a wird which was published as the Hizb al-Lahji. When asked whether the Shaykh could be regarded as a follower of the approach of Imam al-Nawawi of practising tasawwuf without a tariqah his student agreed to this as a sound description of the Shaykh. Lessons in the Haram al-Makki took place under the watchful eye of those who were unhappy with Shaykh al-Lahji not being aligned to the Salafi school of thought. Care was taken to not give ammunition to those seeking to cause problems, such that the older students of the Shaykh advised the younger students in the circle in the Haram al-Makki to avoid wearing turbans so as to not draw attention to themselves. Likewise during lessons in the Haram al-Makki if the Shaykh came across any passage which might be a cause of contention between the Salafi school and others he would pass quickly over it without going in to too much detail. I end these brief notes with something I had been longing to know, namely whether Shaykh al-Lahji had mentioned to any of his close students any of his dreams related to the Messenger of Allah (Allah bless him and give him peace). I was told that the Shaykh had mentioned that he had dreamed of being outside Bab al-Jibril with all the scholars of his time being present with him. The dream had Shaykh Hasan al-Mashat (one of the great Makkan scholars of recent times and a teacher of Shaykh al-Lahji) walking around and arranging the different scholars in to rows/lines to go in to the Masjid to visit the Prophet (Allah bless him and give him peace); with Shaykh Hasan taking Shaykh al-Lahji and positioning him at the front to be the first to go in for ziyarah. On my recent trip to the Hijaz I was fortunate to accompany someone who pointed out to me Shaykh al-Lahji’s grave in the Maa’la graveyard where he was resting in close proximity to his colleagues and other scholars of Makkah. Allah Most High have mercy on him and allow to benefit from him. The pious scholar, Shaykh Abul Hussain bin Zahoor Hasan bin Aal Rasul bin Aal Barakat bin Hamza bin Aal Muhammad bin Barakatullah al-Hussaini al-Wasiti al-Marehrawi, better known as Ahmad al-Nuri. He was from the Sufi scholars, he was born and raised in Marehra and began studies from a young age. He took hadith and the spiritual path from his grandfather Sayyid Aal Rasul. He took the pattern chained narration of firstness (musalsal bil-awwaliyyah) from Shaykh Ahmad Hasan al-Muradabadi from Shaykh Ahmad bin Muhammad al-Dimyati from Shaykh al-Muammar Muhammad bin Abd al-Aziz from Shaykh al-Muammar Abil Khair bin Amus al-Rashidi from Shaykh al-Islam Zayn al-Din Zakariyyah al-Ansari. And this is a very high/elevated chain. I met him in Bhopal more than once and took from him the pattern chained narration of firstness. He was a pious scholar, possessed a radiant face, noble/honourable/generous, heavy set, of a medium height and eloquent. He passed away with 11 days of Rajab having passed in the year 1324. Salam. Please find some Adab of dhikr taken from the ‘Mawsuah’ (21/242). As always any corrections are welcome from fiqh experts. Rememberance of Allah (Most High) has certain adab which have been mentioned by the scholars as being of benefit. And that: When He would exit from the place of relieving oneself he would say: “Ghufranak”. [Al-Tirmidhi (1/12) and said it was a Hasan Gharib Hadith. The view of the Hanafi scholars as in ‘Al-Hidayah’ and its commentaries is that it is desirable for the one making dhikr to be in a state of wudu. From these cases is the Adhan and Iqamah, for if he made Adhan without wudu it is permissible without it being disliked according to the Zahir al-Riwayah as is the case with all forms of dhikr. Al-Shawkani said: Cleaning of the mouth at the time of dhikr with the toothstick (siwak) is a good etiquette, because it is the place where the dhikr of the prayer will be. It is authentically reported: “That he (Allah bless him and give him peace) when he was greeted by one of his companions made tayammum from a wall and then replied to him'” This is just for replying to the greeting so the rememberance of Allah the Glorified is more deserving. [Sharh Hisn al-Hasin (p.32) Nuzul al-Abrar (p.29) The hadith cited be found with a similar wording in al-Bukhari (al-Fath 1/444)]. I have seen so many others with blogs, so I decided to jump on the bandwagon! One of life comforts is to sit down with a warm mug of tea and some nice biscuits and read a good book. I read a bit a bit about the deen in Arabic so I thought I would set up this blog to share with you occasionally some gems that I regularly come across. Also hopefully increasing other peoples desire to learn Arabic as well and access this immense ocean that is within all our grasps. I decided to call it Dar al-Hadith in honour of the great tradition of transmitting the Prophet Sunnah that has been carried out by Islamic institutions across the world, some of which were called Dar al-Hadith. This is also because I have an interest in the hadith sciences which is reflected in my reading, may Allah (Most High) facilitate the study of the Prophetic Sunnah at the feet of the inheritors of the Prophet (Allah bless him and give him peace). Amin.